Active by day and night, the French angelfish will eat brine shrimps and mussels, and can sometimes be tamed. 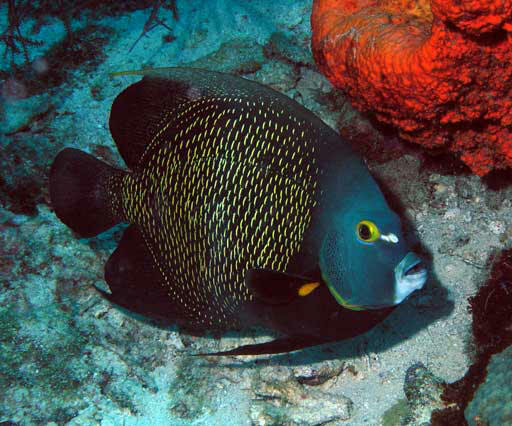 The adult resembles that of the Pomacanthus arcuatus (gray angelfish), but the ends of its scales glow with luminous yellow dots. The young of both species can similarly be confused; they are markedly different from the adults, with curved yellow stripes against a black background. Size: 25 cm. ФУНТ СТЕРЛИНГОВ , денежная единица Великобритании, равная 100 пенсам.